Once you are airside via the northern security check, you will see the elevator for the Skyteam Lounge. Walk a bit further, past the sign for the new Star Alliance Lounge, and the escalators up into the main shopping area, and you will find the Oneworld Lounge via another elevator on level 5. Note that although there has been a huge expansion (and improvement) of the Tom Bradley International Terminal (TBIT), this lounge is in the older part of the terminal, and is not “new”. There is both a business class lounge here and a first lounge. The business class lounge is to the left, the first class lounge to the right. The first lounge doesn’t open until 1130 on weekdays, so if you get there early you will be in the business class lounge first, which is what happened to me. The lounge is large and long. After this initial room, you then walk past long tables laid out as though for dinner, with bottles of wine on them (always welcome at 1030 in the morning), and a self-service buffet along the right hand side of the room. The food selection is fairly limited, though there is a choice of both hot and cold, and a good selection of drinks and snacks. Keep walking and the room opens up slightly, and you have a bar at the end and to the right the toilets and showers. Although the entrance and dining area is a very white space, and reminded me a little of the Cathay lounges in Hong Kong Airport, it’s easier on the eye at the back, which is where I sat. I went almost to the bar and then found some seats with plugs against the wall, logged onto the free wifi and started to work. Towards the distance in this photo some of the terminals have been removed and you can sit down with your own laptop – that’s where I was – there’s free wifi. This is the area at the back – they’ve swopped these seats around as well so the sofas face one another – the bar is that thing with screens behind it – although again, this has changed somewhat. I had some salad from the buffet, and then some noodles, although I’d only had breakfast at the hotel a few hours earlier, and it was still only 1100. There is no excuse. At 1130 I went through a door at the back (after checking it was OK with the attendant) into the First lounge. Quentin Tarantino was waiting for a flight as well – how LA. 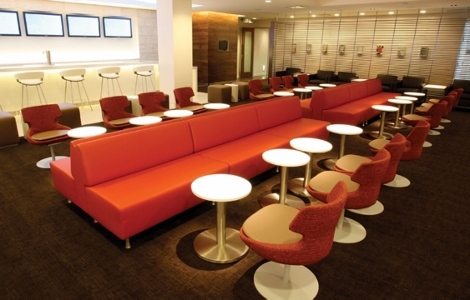 The lounge is similar in style to the business class lounge: a bit quieter, but with a notable lack of plugs. I do wonder if I will ever get over my obsession with power points. It will probably take many years. The food selection was the same as far as I could see, as were the drinks, though there may have been an upgrading on the quality of the wines or the liquor on offer. Flights are called from both of these lounges. 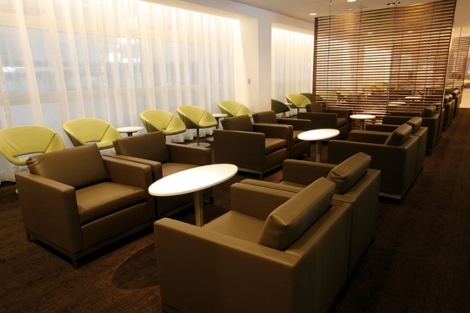 A good lounge, but it needs updating now that the new Star Alliance lounge has opened.